The Alfa Spider surrounds the driver and passenger with technologies that ensure the very highest acoustic and climatic comfort. The result is an enveloping environment, free from vibration thanks to the careful soundproofing and the outstanding torsional and flexural rigidity of the bodyshell. 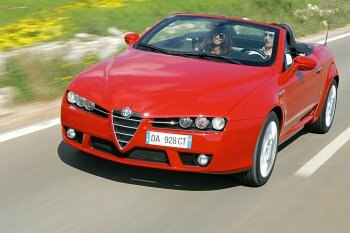 And more: The Alfa Spider offers the sophisticated Blue&Me infotelematic system and its advanced system of voice commands; a bi-zone automatic climate control system with differentiated temperature and air distribution; a Connect NAV+ with 6.5” display and bird-view function, and a Bose® Sound System. The equipment on the new model is completed by a number of significant technological devices that enhance life on board. For example, the rain sensor, which automatically activates the windscreen wipers at the first drops of rain; the dusk sensor which turns the headlights on when the car enters a tunnel; and the standard parking sensor that conveys acoustic and graphic information about the distance between the car and any obstacle. And again, the customer can appreciate the attention to detail, the use of sophisticated, top quality materials (from Frau leather to aluminium parts) and the wide choice of shades for dashboard, seats, hood and external bodywork. In a word, the new car sees off all its rivals when it comes to comfort. And finally, the Alfa Spider includes a sophisticated ‘built-in protection system’ that comprises the volumetric, anti-lift, anti-break-in, anti-theft Safe Lock device. This can mechanically disconnect the lock and the inside and outside handles of the doors, making it impossible to open them from inside, even if the window is broken. 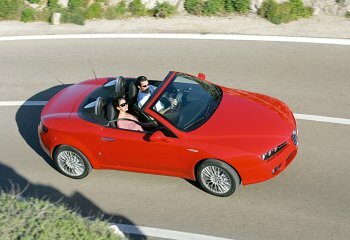 As for the 159 (Sportwagon and saloon) and Alfa Brera models, the latest addition to the Alfa Romeo stable also features the innovative ‘Blue&Me’ system, based on Windows Mobile technology, and developed jointly by Fiat Auto and Microsoft, which changes the communications, information and entertainment paradigms in the car, improving the comfort and quality of the time spent on board. The device is extremely simple to use, and allows you to make/receive telephone calls and to listen to music simply and safely as you drive. And thanks to Bluetooth® technology, you can also communicate with the outside world from the car using your own personal mobile phone or handheld. The system on offer will be supplemented in future with more evolved devices giving access to the many new products that technological progress has in store for the coming years: from a complete multimedia system to satellite navigation. In addition to which there is a whole range of services that will make all your journeys more comfortable, safer and easier. The ‘Blue&Me’ device incorporates a sophisticated hands-free system with voice recognition that guarantees maximum driving safety in all conditions, and respects the law because the driver can use the system without taking his hands off the wheel. The system allows drivers with a Bluetooth® mobile phone to use the telephone even if it is in a jacket or a bag, automatically lowering the radio volume (when this is on) and routing the interlocutor’s voice through the stereo speakers. The system is also extremely compatible with all cell phones currently on the market and can be updated to comply with new standards and future telephones. The ‘Blue&Me’ device is built into the car and the control keys are positioned on the steering wheel for immediate, safe access to the system; the driver can find a number in his phone book by scrolling the control panel display, or ‘mute’ the call for confidentiality. One interesting feature is the fact that the mobile phone only has to be registered with the system once. And more: It is also possible to transfer one’s personal phone book to the car, automatically updating it every time the system recognises a cell phone. Privacy is guaranteed because access is only granted to the phone book if the telephone registered with the system is in the car. The number or name of the caller is shown on the display if it is in the phone book and the number can be called ‘vocally’ by dictating the numbers or pronouncing the name if it has been memorised. The evolved voice recognition process means that the voice does not have to be ‘learned’, The system also allows you to manage and store up to five mobile phones at the same time so that more than one passenger in the car can make direct use of the handsfree set. The programming may be modified whenever you want. And finally, the hands-free system with voice recognition can also reproduce a ‘personal’ call tone using the radio speakers. These are the features of the hands-free system with voice recognition, but there is more to the innovative ‘Blue&Me’ system: it allows the motorist to listen to his favourite music when it is recorded on a mobile phone, one of the new smart phones, on an MP3 player or on a USB key drive. This is made possible by a USB port in the glove compartment, to which any digital device with a similar connection can be connected, allowing musical audio files (MP3, WMA and WAV) to be reproduced directly through the stereo system. And because all the information is visible on the instrument panel display, the client can quickly scroll through the system archive (divided by type, album, artist, etc.) either vocally or using the steering wheel controls, and select the piece he wants to listen to by the controls on the steering wheel. Interior climate is one of the main comfort factors during a trip and is also very important for interior safety because temperature, humidity and ventilation affect the driver’s well-being and thus his or her level of alertness. And of course the heating and ventilation system is also responsible for demisting the windscreen and side windows. This is why the Alfa Spider offers a choice of two climate systems according to the specification and market (automatic dual-zone and manual). The dual zone device is equipped with a control system that automatically controls temperature, air flow, air distribution, compressor activation and recirculation by means of an electronic control unit. The Alfa Spider also implements an equivalent temperature climate control strategy. It records internal and external temperature by means of certain sensors and assesses the sensation of thermal well-being experienced by passengers, i.e. the energy exchange between human body and passenger compartment that is affected by humidity, temperature and treated air flow. Another sensor located in a central position at the windscreen base records solar radiation on the car and the angle at which the rays strike the passenger compartment. This allows the system to prevent an excessive increase in temperature inside the car caused by the sun and thus to inform the climate control system in time. The automatic dual zone climate system can provide two different temperatures and air flows simultaneously: one in the right part of the passenger compartment and the other in the left. The Alfa Brera also offers a sensor that verifies air quality in addition to the dual zone climate control system: the Air Quality System (AQS). This system allows occupants of the Alfa Spider to breathe clean air at all times, even when driving through town or in traffic jams and tunnels. The sensor controls the recirculation function that is turned on automatically to block the intake of outside air into the car when driving through places with high smog levels. 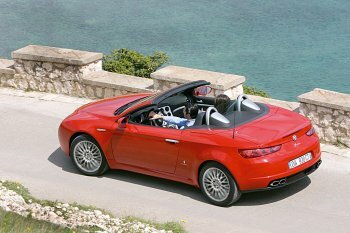 The fully concealed Alfa Spider hood is equipped with a hydraulic system for automated movement. The hood comes with improved looks, streamlining and acoustic comfort. Its practical details have also been improved with mechanisms specially designed to make folding and unfolding operations easier, faster and safer. In detail, the first of its five steel and aluminium arches is shaped to mould to the upper edge of the windscreen thus continuing the exterior shape seamlessly and making the car more aerodynamic with its hood closed. The hood consists of two skins: the outer skin is a multiplayer cloth with good flame propagation resistance while the inner skin effectively soundproofs the passenger compartment. Special features have also been designed and applied to prevent wind noise during driving with the hood closed, even at high speed. Examples include the special shape of the window retaining channels. Aboard convertibles driving comfort must be guaranteed both with the hood closed and with the hood open: hence the continuous quest for various individual performance aspects, such as body stiffness, individual frequencies, weight optimisation, aerodynamics, suspension settings and many other features that may be less well known to the general public but all add up to create a top quality product that can be used to best effect in both configurations. The hood action is also electric and the fold/unfold operations take place automatically. To set the hood in motion, all you have to do is press a button after parking the car and applying the handbrake (this single manual operation has been maintained for safety reasons, since accidental system operation is prevented in this way). In detail, electric hood opening is performed by a specific hydraulic circuit co-ordinated by a special electronic control unit. Lastly, the car may also be equipped with a transparent wind stop that limits air turbulence in the passenger compartment with the hood open to make it possible to enjoy an equally comfortable trip even at high speed. The Bose® Sound System produced for Alfa Romeo by the US company Bose, a leader in the Hi-Fi sound sector, offers each passenger exceptional listening quality under all driving conditions. The Hi-Fi system has a power output of 570 Watts, an acoustic system with six speakers and a subwoofer with a 6-channel digital amplifier (200 Watts) built into the rear bench seat, which plays the lowest frequencies. The Bose® Sound System arouses the same emotions as you feel when you listen to a live concert. The system offers realistic reproduction with crystal clear high notes and full, rich bass tones. It does not fall into the trap of creating unnatural sounds that are initially appealing but are tiresome for the listener in the long run. The credit goes to the new arrangement of the tweeters, on the facia with a central diffuser. The sound also wraps around all the occupants and gives them the sensation that it is travelling through a much larger environment, because the sound system and the passenger compartment have been designed together to ensure perfect harmony between the technical specifications of both. To achieve this result, the Bose® engineers carefully chose all the parts of the stereo system and established the best possible speaker position in relation to the listeners with the aid of advanced design software. An integrated signal processor automatically adjusts bass tones so that they are always perfect at any volume. The device is more sophisticated than ordinary volume controls on conventional devices and ensures a high-quality sound that is always natural. An active equalisation circuit also ensures an excellent automatic electronic balance of all output frequencies, great stability and clarity of tone throughout the audio range. Which means being able to enjoy impeccable musical reproduction in all driving conditions. Sound clarity is also aided by active compressor circuits that ensure the system does not display any distortion, even when the volume is turned up high. The interaction between all these sophisticated components gives rise to the extraordinary sound that has made the Bose® brand famous throughout the world.